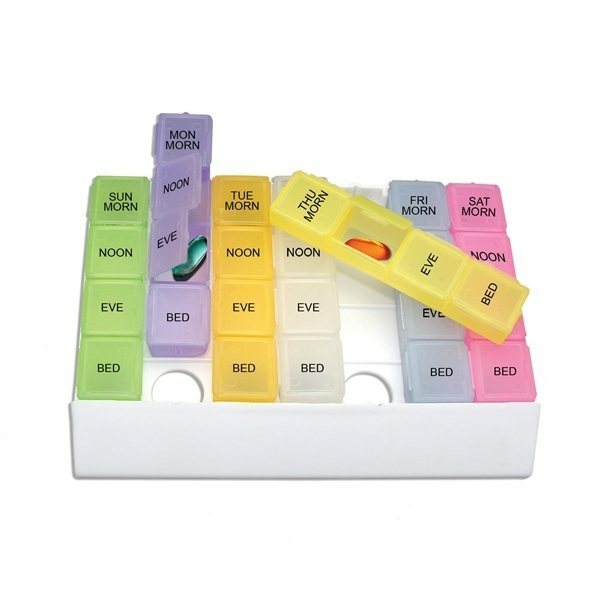 All the features of our popular Jumbo 24/7 Medicine Tray Organizer, plus the additional joy of rainbow-color pill boxes; Plastic base holds seven, removable, four-compartment pill boxes with easy-out design; The plastic base is equipped with convenient, easy-to-use holes for facilitating pill box removal; Pill compartments are 1"x1⅜"x1". These are colorful and the logo print area is much larger than previous pill boxes I have ordered so I am very happy about that. The only thing that could be better is the ease of opening the individual pill boxes. We give these to the elderly population and sometimes they have difficulty getting the boxes open. The lift tab is just not pronounced enough. They would be perfect if the lift tab was a little bigger allowing easy opening. The products were great!!! Merchandise was Fine. These were really of a far greater quality than I was expecting these to be!